Unfortunately, CFB has seen fit to not schedule any Vintage side events this year. One of our group contacted them and they replied saying that they'd be happy to fire an event if we can get the people together. I believe our team will have 4-6 people with no-proxy decks. If you're interested in playing a Vintage side event, what time works? I'll also be carrying a couple proxy decks if anyone wants to play a few casual games or if we can get enough people to get something unofficial going. Saturday evening, we're doing a get together after side events. Join us for craft beer and wild game hot dogs at Moon Tower Inn. It's a ~$7 Uber ride from the venue. Watch @texasLhurgoyfs on Twitter for the latest updates. If you'll be in Houston and have any questions, please feel free to contact me! Ill be around most of the weekend and would be down for vintage most nights. We should try to work it around the legacy side event schedule and pick a time. There's some discussion of a few of us driving down for the day, in which case I'd obviously be up for some sanctioned Vintage. I'm kinda interested in doing either a Pauper or Legacy side, but I'll make those work around this. 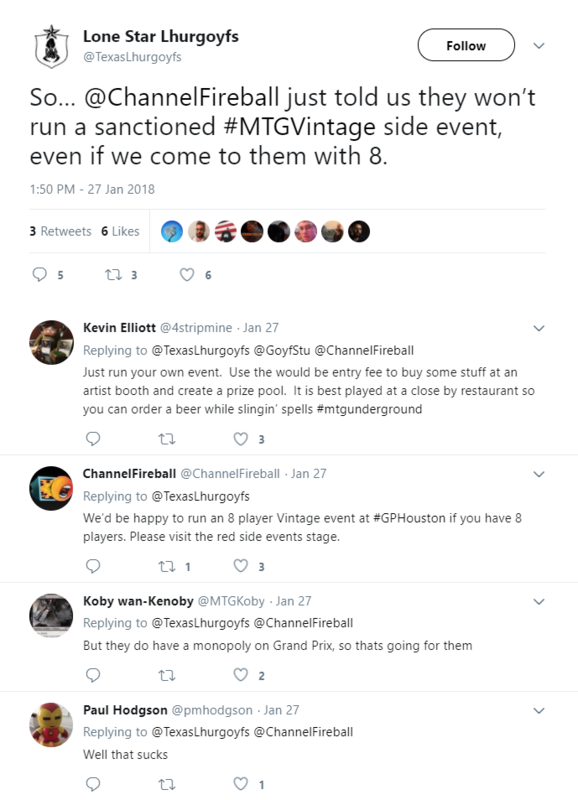 Stu approached several staff at the side events stage regarding starting Vintage as an On Demand Event. All staff told him that they couldn't do it but they'd be happy to allow him to play Vintage in "turbo town*"
A few hours after our annoyed tweet (and several more annoyed replies), CFB responded that they'd be happy to run Vintage. By then, most of us had either headed for food or signed up for other events. So in any case, best of luck to those who wish to play Vintage at a grand prix. * Turbo town - $5 entry, 10 prize tix participation, 20 prize tix to winner. Go again as often as you want. Basically cash games but for prize tix.